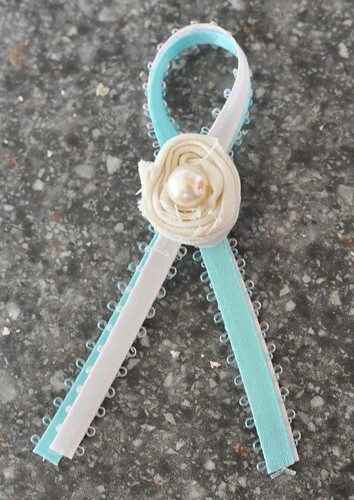 PAIL Remembrance Ribbons ~ Donate $5 to Sufficient Grace Ministries to receive this beautiful ribbon! 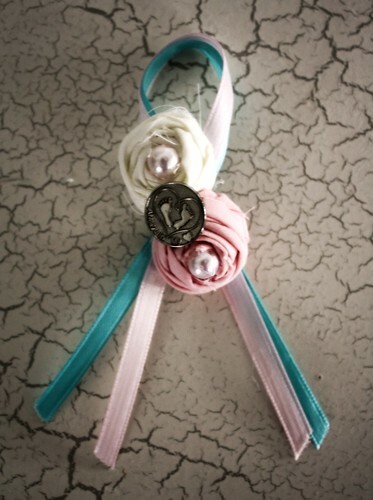 Raise money for Sufficient Grace Ministries for Women just by searching the web and shopping online! Valentine's Day is quickly approaching. 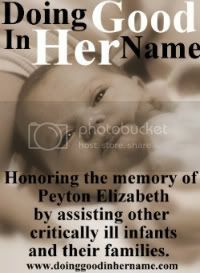 Write about something special a friend, family member, or other loved one did for you after your baby(ies) died that really touched your heart. So many people did kind and loving things for us before and after I gave birth to Carleigh, but there is always one that stands out among the rest. I have shared this before on here but I would love to share it again. On April 3, 2009 we had an evening visitation at the funeral home for Carleigh. Anthony and I got there a bit before the visitation started and just spent some time with Carleigh by ourselves. People came to show their love and support. Many family and friends traveled several hours to be there, which we greatly appreciated. When our pastor arrived he had a package for me that had been sent to our church. The package was from Sue from My Forever Child. Apparently Sue had been following along with our journey as I blogged and was touched by our faith and devotion. Sue gave us her sympathies and had enclosed a gift for me. I just couldn't believe it when I opened it up. 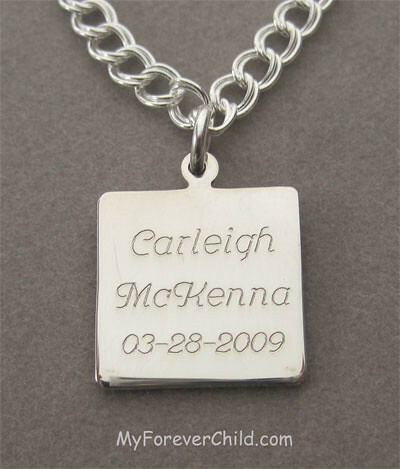 She had sent me a bracelet with Carleigh's footprints on it and with her name and birthday engraved on it. I was floored. Here, somebody I didn't even know had sent something so wonderful and meaningful at I time I really needed it. Sue had taken her footprints off the blog and put it on a piece so that I could take her with me wherever I went. I think I showed everyone that walked in the door my bracelet that evening because I was so excited about it. In addition to my bracelet, Sue also sent a small bag of pins for our family members to wear. The pins have the logo of My Forever Child and the saying "Always in my ♥". I passed them out to our family at the visitation and also kept one for myself . My parents still wear their pins every Sunday to church. Ever since that moment, Sue and My Forever Child has held a special place in my heart. I'm so glad to call her my friend. I've since purchased several more remembrance pieces from her and given away many pieces. I've even become an affiliate where I earn money from every purchase through my link, which I use to help buy remembrance jewelry for other loss moms or to giveaway here on this blog. Sue has shown me how much it means to be the recipient of a small act of kindness. I only hope to keep paying it forward. I found out that Save the Children is sponsoring a charity drive to collect caps for babies in an effort to reduce the number of newborn deaths in impoverished countries (which is 4 million per year). The drive is running from now to February 28th. 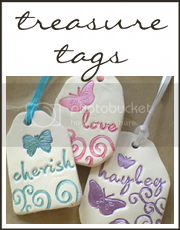 For more information and for easy, free patterns click here or go to a local craft store. I know a lot of you out there can knit/crochet and so I thought I would post about this in case you wanted to help. I, unfortunately, am not gifted in this area but I wish that I was! My friend Katie shared a song with me-What It Means To Be Loved by Mark Schultz. I hadn't heard it before so I listened to it. Oh my gosh. Tears! The first half of the song spoke to me the most because I could really relate to it. The second half-not so much. But only because we had a different outcome. I wanna show her what it means to be loved"
I don't know if Carleigh could feel the love that I had for her while I was carrying her but I hope that she did. I hope that she can feel my love now. On the outside we look like a perfectly happy family. And don't get me wrong, we are happy....but beneath the surface there's more you can't see. There's missing and hurt and a deep hole. Today I took Lainey in for her 4 month check-up. As we were sitting in the waiting room a lady came in with her toddler girl and infant son, both babies close in age to my own. She checked in and sat down. I was playing with my girls and she must have been watching as she asks how old Kyndra was and I replied that she was 3. She then starts talking about her children being like 22 months apart and it being the perfect age gap and blah, blah, blah.... I kinda quit listening after her proclaiming it such wonderful spacing. I hope she didn't notice and I hope I didn't appear unfriendly. I just kinda got lost in my own thoughts. I was thinking that no, it isn't perfect. Perfect would be having another little girl nestled between the two. But she couldn't see that. I was tempted to say something but I didn't. I didn't want to make her uncomfortable. Oh, but I was so close. I really was. I did say back to her that Kyndra was really good with her sister, which is true. That was the best I could get out. Luckily, I didn't have to deal with any more because we got called back. I wish that people could see the missing link in our family. I wish they could see the little girl that still lives in my heart. There's a void they can't see and nothing can fill it. Over Christmas the team members of Grieve Out Loud had a little gift exchange. Heather was my Secret Santa and she got me a gift certificate to The Vintage Pearl. I’ve always wanted to get something from there and now I had an excuse! 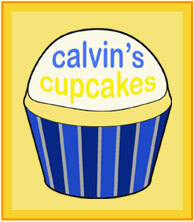 I use my gift certificate and a coupon code and got a great deal. The night I went on their site looking for what I wanted was when the posted one of their newest items. It was this antique silver cross necklace that you could have inscribed with a verse on the back. Perfect! I bought it and had it inscribed with Psalm 73:26, which is the verse at the top of my blog. Over the weekend my necklace finally arrived. I love it a lot! Thank you so much Heather! Thank you to Carly for the wonderful pictures!!! I just love the purple sky so much-absolutely perfect! 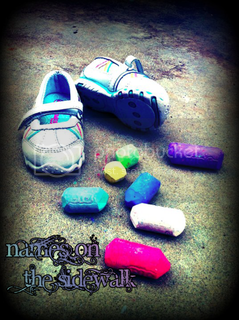 I’ve also added more photos to their name galleries on the FB page. Thank you to everyone who has sent or tagged me in a photo. I just wanted to share a new forum with everyone out there. 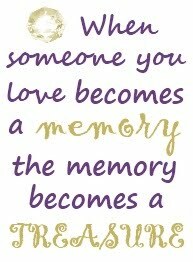 It's called the Stillbirth Forum and it was created by my friend Amy. It's a place where anyone-moms, dads, friends, family of loss-can come and talk to each other. I've already signed up for it and have been posting. I encourage everyone to at least check it out and it would be great if you signed up too because the more people who are active in the forums the better. Thank you Amy for creating the forum! I remember on the day we got Carleigh’s diagnosis I came home that evening from the hospital and I spent some time on the computer. At that time, I spent a lot of time on Cafemom and had made quite a few friends there. So I got on and I wrote a post on my journal on the site about what had just happened (and later transferred it here to this blog). I don’t know how I got through those days as well as I did. Well, actually I do. It was God’s strength lifting me up and pushing me forward. I’m convinced the prayers of so many were showering down on us. There was no way I could get through any of this without God guiding me. My own strength would simply not be enough. If I had tried to do this on my own I really don’t know how I could’ve coped so well. People often say that they wouldn’t be able to be as strong if it were them. My reply? You simply cannot know this. You do not know what you are capable of until you are in that moment, until it happens to you. I think we often underestimate ourselves and God. There’s a song by Matthew West on his new album The Story of Your Life. It’s called Strong Enough and I immediately took a liking to this song the first time I heard it. I think it adequately says that our strength isn’t enough but God’s is. Carleigh & Jordan have been added to The Wishing Tree. You can view Carleigh’s here and Jordan’s here. If you’d like your baby added to the tree click the button above. It's a new year again. I can't believe how fast these past years have went. You'd think I'd say that these past 2 years since Carleigh have been horrible, you know, with her not being here and all, but they haven't. Aside from grieving, they've been pretty good. We've had a lot of good times as a family. 2008, 2009, and 2010 brought us 3 beautiful daughters. I'm pretty happy about that. I just wish we didn't have to say goodbye to one of them. I just mentioned the other day at Anthony's parents' church that if Carleigh was here we'd have 3 girls under 3. It'd be so fun to tell people that we have 3 under 3, but we can't without making people think we're off our rockers seeing how they'd only see two. New year's resolutions? I don't do them, but I have hope that 2011 will be a great year. For us and for many others. So here's to the new year......may it be everything we want it to be. My Forever Child - Remembrance Jewelry, Memorial Keepsakes, Sympathy and Decorative Gifts to comfort those touched by the loss of a Child. 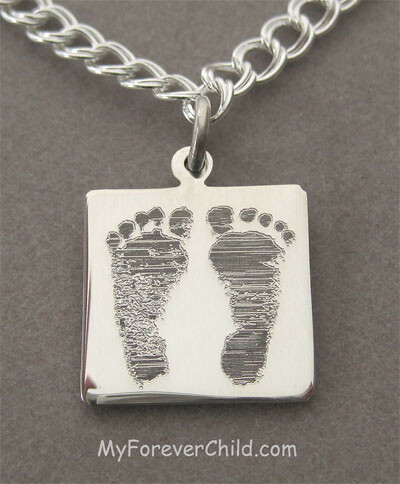 Personalized, Engraved & Handcrafted Miscarriage-Pregnancy Loss Bracelets, Baby-Infant Footprints Charms, Custom Necklace Pendants with your child's Footprint, Handprint image or photograph. Please feel free to email me with any questions, comments, etc. I just love hearing from you! 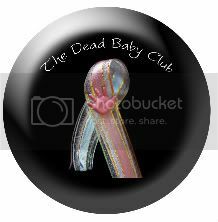 If you are carrying a child with a fatal diagnosis or have lost a child and need some direction feel free to email me at caring4carleigh at yahoo dot com. Contains Carleigh's story as told here. Click picture to buy. 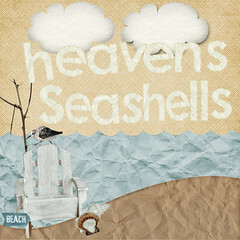 Heavenly Birthday - 3 years of Vitória! Sunshine, Then a Storm, Now a Rainbow. 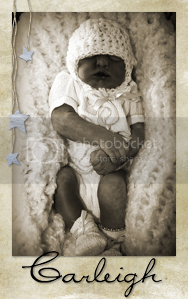 Created with ♥ by Mommy. © 2008-2012 Caring for Carleigh. All rights reserved.